Corsica Ferries ticket reservations, ferry timetables and passenger information for Corsica Ferries sailing to and from the French ports Marseille, Toulon and Nice and from Italian ports in Savona, Genova, Livorno and Civitavecchia. Booking Corsica Ferries tickets has never been easier, we compare all Corsica Ferries prices in real time providing fast quotes so you can buy the cheapest available Corsica Ferries tickets to and from the French ports Marseille, Toulon and Nice and from Italian ports in Savona, Genova, Livorno and Civitavecchia online with instant confirmation. So whether you are looking for a day's shopping ferry trip abroad or a holiday break travelling by Corsica Ferries is a quick, easy and stress free way to get there and back again. Book you Corsica Ferries car or passenger ferries tickets with us and enjoy more choice and flexibility. With the latest Corsica Ferries crossing information and timetables for all ferries sailing to and from the French ports Marseille, Toulon and Nice and from Italian ports in Savona, Genova, Livorno and Civitavecchia including information on the ferry ports and useful tourist information about the destinations our detailed route and city maps will help you plot your Corsica Ferries ferry journey. If are travelling by car, with your family or as a solo foot passenger book a ferry crossing with Corsica Ferries and arrive at your destination refreshed, relaxed and happy. Corsica Ferries offers fantastic fares to and from the French ports Marseille, Toulon and Nice and from Italian ports in Savona, Genova, Livorno and Civitavecchia ferries ports. Book Corsica Ferries tickets to and from the French ports Marseille, Toulon and Nice and from Italian ports in Savona, Genova, Livorno and Civitavecchia online in advance at Ferryto.co.uk and you will always enjoy our cheapest available ferry ticket price. The price you see is the price you pay. There are no hidden extras or surprises such as added fuel surcharges or booking fees and we do not charge you anything extra for paying with a Visa Electron card. The price we quote you for your selected Corsica Ferries route, onboard accommodation and vehicle type is all you will pay, and that's a promise. To obtain a Corsica Ferries ticket price and book your ferry ticket securely online please use the real time ferries booking form on the left. Corsica Ferries harbours are in L'ille Rousse, Calvi, Ajaccio, Propriano, Porto Vecchio and Bastia. 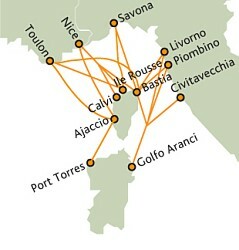 The shortest routes is less than four hours by a fast boat connect Nice with Calvi and Livorno with Bastia. These two lines are also the cheapest ones. Another short route lead from Northern Sardinian port of Santa Teresa di Gallura to Bonifacio in Southern Corsica. Medmar used to sail between Naples and Porto Vecchio, but this line desn't seem to be operated any more. Corsica Ferries and Sardinia Ferries are marketing names used by Corsica Ferries, a France-based ferry company that operates traffic to and from the islands of Corsica and Sardinia. Corsica Ferries are a ferry company which started services in 1967 under the name of Corsica Line with the ferry Corsica Express. Since the company’s humble beginnings its has grown into what is today the market leader to Corsica and Sardinia as Corsica Ferries Sardinia Ferries. Corsica Ferries are the premier ferry operator on the Western Mediterranean Sea transporting more than 1 million passengers annually aboard their ferries running to and from France and Italy to Corsica, Sardinia and Elba. Corsica Ferries operate 2 return routes from Italy to Sardinia and 10 return routes from France and Italy to Corsica, with a total of up to 13 crossings daily. The fleet currently consists of 14 vessels. Most of our ferries to Corsica and Sardinia offer nice cabins, bars, self-service and a la carte restaurants, children's playroom, swimming pool, solarium and shops. In 1996 the fast ferry Corsica Express opened the route Nice to Corsica. The fast ferries made it possible to enter the market between the French mainland and Corsica. Such a fast ferry was also used between Italy and Sardinia. The ship, formerly the Color Festival, was bought from the Norwegian Company Color Lines Cruises and renamed Mega Smeralda by Corsica Ferries. It is 171.50 m long and 28 m wide. Its speed rises to 28 knots. Following re-fitting in the Wharf Megatechnica in Greece it can take 2000 passengers and 560 vehicles. The ship has 539 cabins and is comfortably equipped (restaurants, bar, conference rooms, children's playroom, shops etc). Due to its size, facilities and design the Mega Smeralda is the flagship of our shipping company. Since 13 June 2008 it has sailed between Italy and Sardinia and since 20 June 2008 also between Italy and Corsica. Mega Smeralda provides Corsica Ferries with the 14th ship of its fleet. Fast during the day (up to 30.5 knots), comfortable during the night (up to 370 cabins) the Mega Express ferry offers you all amenities of a big ship which can take up to 2100 passengers and 650 vehicles. Enjoy the service on board: a la carte restaurant, cafeteria, pizzeria/ pasta, buffet, swimming pool, bar, video games, shops. Our classic ferries Corsica Victoria and Sardinia Regina offer you cruises the following amenities: cinema, boutiques, a la carte restaurant, cafeteria, swimming pool, pleasant lounges. Due to the regular and frequent departures of the Corsica Shuttle (Corsica Marina II) you can choose from a wide variety of departure times offering flexibility to your travel plans. The ship Sardinia Nova was the first yellow ferry to connect Livorno and Olbia. In 1987 the fleet was supplemented by the "Sardinia Vera". On board you will find a bar, a cafeteria and a boutique. Also the routes operated by Grimaldi Lines from Civitavecchia were probably discontinued in 2011. Most of our ferries to Corsica and Sardinia offer nice cabins, bars, self-service and a la carte restaurants, children's playroom, swimming pool, solarium and shops. In 2001 the Mega Express Ferries were introduced which made various new routes possible between Toulon and the ports of Ajacco, Calvi, Ile Rouse and Bastia. In 2004 of all ferry companies Corsica Ferries carried most of the passengers to Corsica. 2004 was also the year when the flag ship of the company, the Mega Express III was put into operation on the route to Sardinia. Best Price Guarantee - We always offer you our lowest available Corsica Ferries ticket price and there are no hidden extras or surprises such as added fuel surcharges or booking fees and we also we do not charge you anything extra for paying for your ferry ticket with a Visa Electron card. The price we quote for your selected Corsica Ferries car or passenger ferry ticket, onboard accommodation and vehicle type is all you will pay for your ferry ticket, and that's a promise! In the unlikely event you find the same all inclusive Corsica Ferries ticket cheaper in the brochure of any other tour operator we promise that we will do our best to beat that price or offer you the choice of requesting a refund. To book Corsica Ferries tickets please click here. Discounted Group Travel with Corsica Ferries - Ferryto.co.uk offer a dedicated personal and affordable Corsica Ferries group and coach party ferry passenger reservation service offering you the lowest available ferry rates. Our specialist Corsica Ferries group travel team will secure the best deal for you and your passengers. The only requirement to qualify for discounted group travel ferry rates is that your party should be at least ten people and travel at the same time. For more information about group travel on Corsica Ferries please click here. Ferry Logistics offer a personal and affordable Corsica Ferries freight and cargo ferries reservation service to and from the French ports Marseille, Toulon and Nice and from Italian ports in Savona, Genova, Livorno and Civitavecchia. In addition to offering preferential rates to commercial operators and haulers Ferry Logistics is now also able to offer discounted ferry freight rates to private customers such as those wanting to take transit vans on any of the Corsica Ferries routes serviced. For more information and an instant online quote for your commercial vehicle ferry crossing please click here. At ferryto.co.uk you are able to obtain live Corsica Ferries ticket prices, check availability, view ferries timetables and book Corsica Ferries car and passenger ferry tickets at our lowest available ticket price. Ferryto.co.uk is part of the world's largest online ferry ticket distribution network providing the ability to book over 80 major European ferry operators including with Corsica Ferries to over 1,200 ferry routes throughout the UK, France, Spain, Ireland, Holland, Eastern Europe, the Mediterranean, the Baltic and North Africa. Choose Corsica Ferries ferries for the cheapest ferry ticket prices to and from the French ports Marseille, Toulon and Nice and from Italian ports in Savona, Genova, Livorno and Civitavecchia. We also have ferry offers to more distant ferry destinations and mini cruise destinations like Ireland, Holland, Italy, Spain, Denmark and the Greek islands.